That's great that you got to go to Dashner's book signing. Maybe I will make it to one at some point. I really loved the first 13th Reality book. Have you read it? Please include me in your giveaway. 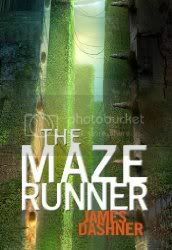 The Maze Runner is on my wishlist. I am a follower. I've read the first 13th Reality book, and have the 2nd but haven't read that yet. I'm waiting until next year when the 3rd is released and read all three then. Have you read The Maze Runner yet? I would love to be entered in this draw. Thanks!! Thanks very much for doing a book giveaway, that's awfully cool of you. I'm pretty excited to read this one, the way you've been talking it up. Would love to win a copy of this! Keep meaning to read it. Read a lot of good reviews about this book. Would love to read it. Congrats!! =) I'll get in touch with you on getting the book to you.